Ever since this past Tuesday, we here at Cinema Blend haven’t been able to go a few moments without thinking about the same thing: the brand new Batman costume that will be featured in Zack Snyder’s Batman vs. Superman. 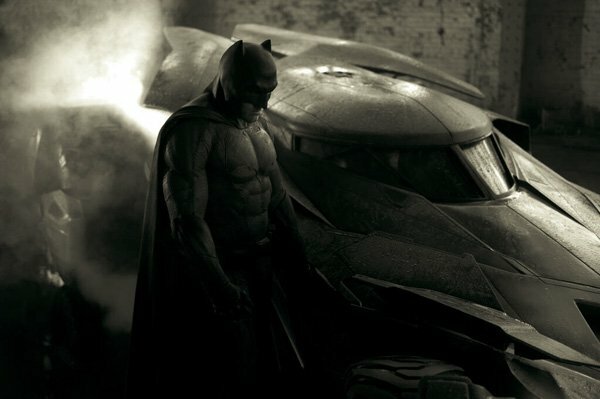 Revealed in black and white through the director’s official Twitter account, the image showed us that the next big screen version of the Caped Crusader will look unlike anything we’ve seen before in live-action. We just can’t seem to stop talking about it, so naturally I decided to make it the topic of the week for the latest episode of Hero Blend. Some filming has already begun on the superhero mega blockbuster and production is expected to stretch through the summer, and while it’s not entirely clear why now was the perfect time to show off the costume is a bit of a mystery. Donning the cape and cowl in Batman vs. Superman is none other than Oscar-winner Ben Affleck, who looks like he has put on some serous muscle for the role. We can’t wait to see him and action and hear what his voice will sound like, but let’s not get ahead of ourselves! Given that this is the first time we’ve talked about a costume reveal on Hero Blend, I decided to go for a special co-host. Rather than having one of my fellow reporter friends on, this week I am joined by Tony D’Amato, a professional storyboard artist and big Batman fan. We had a great chat about both the new Batsuit and the Batmobile, so enjoy the episode posted above! Batman Vs. Superman will be hitting theaters on May 6, 2016, and you can find more episodes of Hero Blend right here.